A 70-year-old woman with jaundice who had been diagnosed with unresectable malignant distal biliary stricture underwent endoscopic ultrasound (EUS)-guided gallbladder drainage following failed endoscopic retrograde cholangiopancreatography (ERCP). 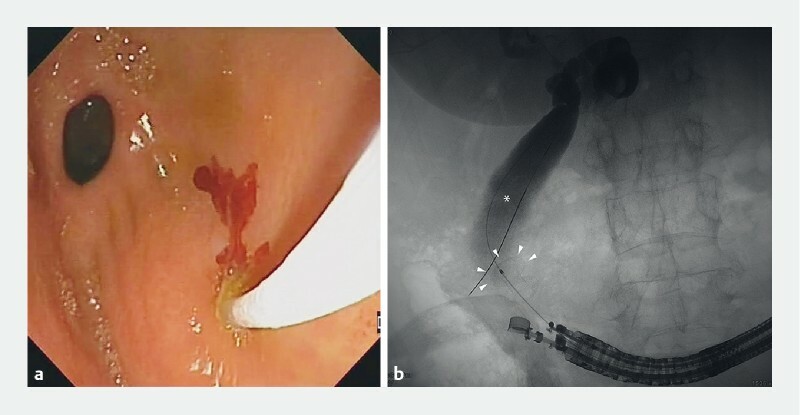 EUS-guided bile duct drainage was impractical because of the presence of an intervening vessel, and an EUS-guided cholecystogastrostomy was created with placement of an 8 × 8-mm lumen-apposing metal stent (LAMS) . After 1 month, the patient complained of a recurrence of her jaundice and was scheduled for follow-up endoscopy. 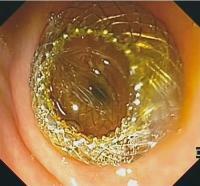 This revealed that the proximal flange of the stent was completely buried in the gastric wall ([Fig. 1]). A linear echoendoscope was then used, and a bending cannula (SwingTip; Olympus) was smoothly inserted through the fistula into the buried LAMS under combined fluoroscopic guidance. Injection of contrast medium revealed a distended gallbladder and slightly dilated intrahepatic biliary tree with no contrast leakage, confirming that the distal flange was still in the correct place ([Fig. 2]). Fig. 1 The buried stent is seen in the wall of the gastric antrum: a on endoscopic view, showing the proximal flange of the lumen-apposing metal stent completely buried in the gastric wall with a 2-mm fistulous orifice visible on the covering tissue overgrowth (arrow); b on endoscopic ultrasound view, showing the proximal flange (arrowheads) within the gastric wall; a clearly visible hypoechoic gastric muscular layer (*); and the distal flange in place in the gallbladder (arrow). Fig. 2 Images following injection of contrast through the buried lumen-apposing metal stent (LAMS) showing: a on endoscopic view, the cannulation of the fistulous orifice; b on fluoroscopic view, the distended gallbladder (*); the guidewire coiled inside the gallbladder; and the distal flange of the LAMS still in place (arrowheads). A 0.035-inch guidewire was then passed through the cannula and coiled within the gallbladder. The delivery catheter of a 10 × 10-mm electrocautery-tipped LAMS (AXIOS-EC; Boston Scientific) was advanced over the wire into the gallbladder without energizing the device ([Video 1]). The distal flange of the second LAMS was deployed in the gallbladder beyond the distal flange of the buried LAMS under fluoroscopic guidance. Slight traction was applied on the endoscope–stent coupled system, which allowed the proximal flange of the second LAMS to be deployed in the gastric cavity under endoscopic vision ([Fig. 3]). A through-the-LAMS-in-LAMS cholangiogram confirmed that the stent was correctly in place and that there was no contrast leakage. The post-procedure course was uneventful. Video 1 Video showing a salvage procedure for a buried lumen-apposing metal stent (LAMS) after an endoscopic ultrasound-guided gallbladder drainage: the LAMS-in-LAMS technique. The second LAMS (red dashed line) has both larger flanges and a longer body than the first LAMS (arrows). This ensures a perfect fit for the two coaxial stents. Fig. 3 Endoscopic view showing the proximal flange of the second lumen-apposing metal stent correctly deployed in the gastric antrum. A buried LAMS is a rare complication, previously reported for various indications and managed, when possible, by endoscopic stent removal   . In fact, stent removal is not only a technically demanding procedure but also, in the setting of biliary drainage, it increases the risk of bile leakage and subsequent peritonitis. The above-described LAMS-in-LAMS technique allows the endoscopist to re-create a safe drainage conduit without the need to remove the buried stent.